Velpanat is one of the top-of-the-line coformulated drugs. Thanks to its unique powerful formulation, which provides a highly impactful beneficial effect on the development of the infectious pathological process, it is considered the first-choice medication in the treatment of HCV. It includes two main functional ingredients: Sofosbuvir and Velpatasvir. The latter belongs to the class of advanced NS5A inhibitors, which are regarded as universally effective in blocking replication of pathogenic HCV RNA. Thanks to this precise component, the drug is actively prescribed for the treatment of patients suffering from HCV genotype 1, 2, 3, 4, 5, or 6 infections. As for the first mentioned ingredient – Sofosbuvir – it provides effective inhibition of enzymes involved in the metabolic processes responsible for the synthesis of new viral RNA. Therefore, it prevents both the reproduction of pathogens and the progression of the disease. Once the pills are taken, they are completely absorbed in less than half an hour. The medication contains Sofosbuvir at a dosage of 400 mg and 100 mg of Velpatasvir. The maximum concentration of the active substances in the blood plasma is reached 1-2 hours after their absorption with up to 65% of the active substances bound to the specific plasma proteins. All components of the medication are catabolized in the liver and extracted within 12 hours after their introduction in the body. The medication demonstrates extremely satisfying results in the treatment of all types of hepatitis C.
The obtained results are considered extraordinary successful and provide ground for optimistic estimation of the currently adopted curative approaches. Depending on the severity of the disease and the general health status of the patient, the drug may be administered together with Ribavirin. Patients undergoing the therapeutic course demand regular monitoring and evaluation of the severity of the clinical signs of hepatitis C. The consulting physician must monitor the dynamic pattern of treatment and, if necessary, correct the dosage of the drug. Naturally, it is necessary to strictly observe the prescribed dosage, the frequency of administration and the duration of the therapeutic course, in order to eschew severe negative reactions and achieve the desired result. Changes in the hemoglobin levels. 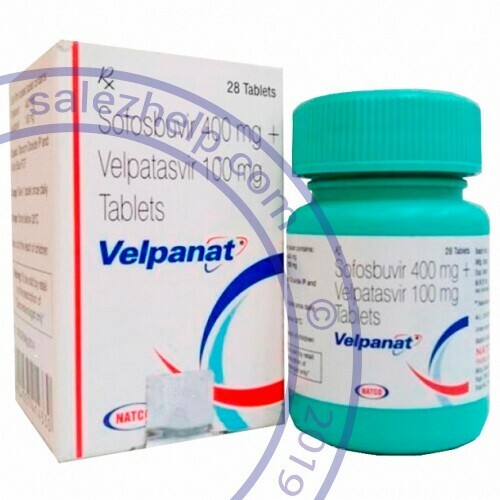 According to the data made available by the Velpanat manufacturer, in most cases, side effects are mild or moderate. Serious complications are observed in case of the continued therapy against the background of a significant increase in transaminase levels. The combined use of Velpanat with Ribavirin increases the risk of adverse reactions. Amiodarone used for the correction of heart rhythm disorders. Rifapentine – an efficient antibiotic prescribed to treat a great number of infections, including tuberculosis. Oxcarbazepine – an anticonvulsive drug prescribed for the treatment of epilepsy. Efavirenz – a medication prescribed for HIV treatment. Dabigatran – a drug used to reduce blood clot formation. Modafinil – a very popular medication used to cure drowsiness. Concomitant administration of these and several other medications may lead to additional side effects. If such therapy is considered obligatory and the pros significantly outweigh the cons, the doses should be adjusted to reduce the risks.